(Money magazine) -- "What's a realistic retirement age? How much longer will most of us have to work?" -- Charles Maimone, Wilmington, N.C. The answer depends on how successful you've been at saving, how cushy a lifestyle you would like to have and, of course, when you prefer to disengage. That said, after the battering 401(k)s took during the financial crisis, a lot of people feel they'll have to stay on the job beyond the traditional age of 65. In a recent Wells Fargo survey, 12% of affluent Americans estimated that they'd have to work until age 80 to live comfortably in retirement. Okay, that's extreme. But when SunAmerica Financial Group surveyed pre-retirees last year, it found that workers were expecting to exit at 69 on average, up five years from a decade earlier. There's no doubt that if you've fallen behind in your retirement planning, staying in the workforce longer can dramatically improve your chances of achieving a secure post-career life. You'll have more years to contribute to your retirement accounts, and your investments have more time to grow. And the combination of extending your career and postponing Social Security can often boost the size of your benefit by 8% or more for each additional year you toil. Every extra year you work is also one fewer that your savings will have to support. That alone reduces the chances that your savings will run out. Those are just the financial benefits: Research shows that as long as you're not slogging away at a job you abhor, working can improve your physical and psychological well-being and keep you more socially engaged. As helpful as postponing your exit can be, relying on a longer stint at work to improve your retirement prospects can backfire. Why? Just because you want to stay on the job doesn't mean you'll be able to. A survey last year by the Society of Actuaries shows a big disconnect: While only 37% of workers said they expect to retire before age 65, more than 80% of current retirees left their jobs before that age. Undoubtedly, some got out early because they had the financial wherewithal to do so. But according to the Employee Benefit Research Institute's 2012 Retirement Confidence Survey, about half of retirees leave the workforce earlier than planned. Top reasons: health problems, being forced out of a job, or having to care for a spouse or other family member. Similarly, even though polls report that 70% to 80% of preretirees plan to include part-time or some other type of work in their retirement routine, EBRI found that only 27% of current retirees have done so. Future retirees may buck the trend -- or find that landing a job isn't so easy. When you base your planning around the premise that you'll have lots of time on the job and those extra work years don't materialize, you could find yourself with a nest egg that's too small to support you -- and very few options for growing it. 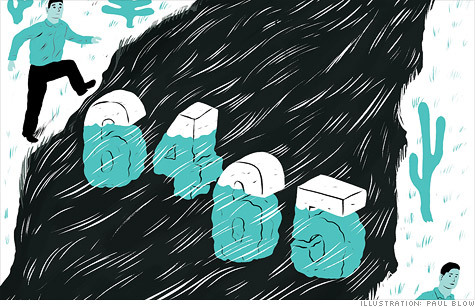 Will contributing the max to a 401(k) be enough? I think the smarter strategy is to set a reasonable retirement age -- say, 65 or your age for collecting full Social Security benefits (66 to 67 these days) -- understanding that you may not hit it exactly. Then periodically check your progress using an online tool like the T.Rowe Price Retirement Income Calculator. You can move up that goal if you're doing well. But if within 10 to 15 years of your planned exit you find you're behind, ratchet up retirement contributions as much as possible. As the graphic shows, that may not improve your prospects quite as much as working a few more years, but it'll leave you in much better shape should you find yourself unable or unwilling to stay on the job. If waiting turns out to be your only option, fine. You do what you have to do. Retirement life will be a lot more enjoyable, however, if working longer is something you do because you want to, not because you have no choice.